Hedge Row, one of Kimbal Musk’s two new restaurants, opened April 3rd. Photo by Fatih Tokmo. 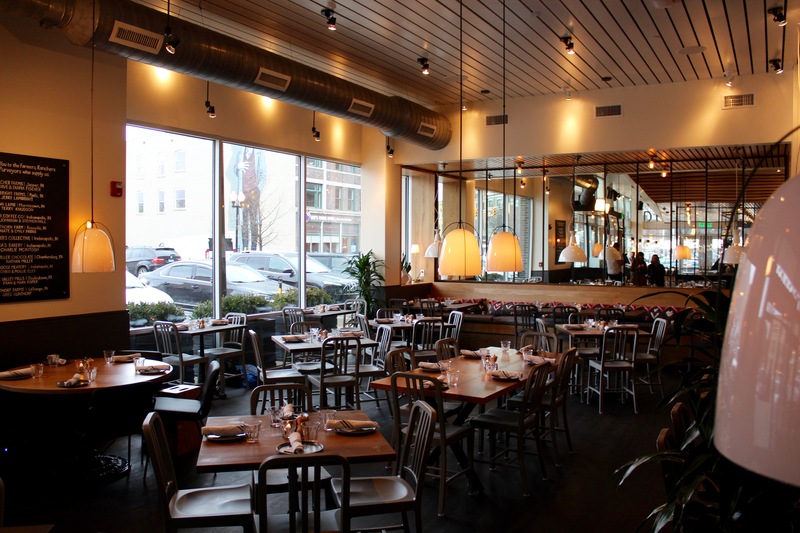 Hedge Row American Bistro, one of Kimbal Musk’s two new restaurants promoting locally sourced food, opened April 3 on Massachusetts Avenue. On March 29, I attended a private preview event at the space with several other Butler students, tried some food, got some photos and briefly met Musk. Hedge Row is described on its website as being a “relaxed American Bistro featuring rustic dishes from a wood-fired oven.” The space itself is simultaneously rustic and modern, featuring wooden tables paired with metal chairs and fixtures. There’s a long wooden bar, a visible kitchen with a wood-fired oven and a large sign listing the local Indiana farms in which the restaurant’s food is sourced. A few of the local farms, ranchers and shops that supply food to Hedge Row include Fischer Farms in Jasper, Lambright Farms in Paoli and Silverthorn Farm in Rossville. Hedge Row’s efforts to use local food stem from Kimbal Musk’s work to promote sustainable food access in cities across America. Musk also founded the Big Green Initiative that aims to bring “learning gardens” to thousands of low-income schools across the country. Thirty-one of these gardens have been installed in Indianapolis schools already. Musk could be seen walking around last week’s preview event all evening, wearing an all-black outfit and his characteristic white cowboy hat, talking with guests. He also gave a brief speech in which he thanked Indianapolis for its hospitality, and told a heartwarming story about the kindness he has experienced since visiting. To celebrate Hedge Row’s upcoming opening, he sabered a champagne bottle with a butcher knife because, as a chef, this was naturally his tool of choice. The food at the event, including vegetable samosas, chicken sandwiches and appetizer strip steak skewers from Fischer Farms, provided just a taste of what the restaurant’s full lunch and dinner menus will offer. The menus will include both small and large plate options, ranging from a $10 “Little Gem” salad with avocado and spiced pecans, to a $38 Fischer Farms steak with bernaise sauce. Claire Christensen, a sophomore environmental studies major who was able to attend the event, emphasized how unique it felt to be around Musk and experience one of his many projects regarding sustainable food. “I enjoyed seeing so many people celebrating the new restaurant and their passion for locally sourced, low impact food,” she said. “Also, it was motivating to see Kimbal’s success with combining food and environmentalism. Another sophomore environmental studies major, Grace Hart, enjoyed the unique experience of attending the event, meeting Musk and trying out the food. A month after the opening of Hedge Row Musk’s second restaurant, Next Door American Eatery, will open on May 3 on College Avenue.